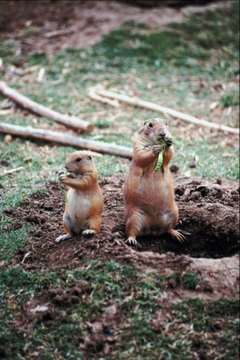 What Is the Difference Between a Prairie Dog & a Gopher? Prairie dogs and gophers are both rodent species living in North America. Though both the prairie dog and gopher live in burrows underground and hibernate in winter, there are a number of differences between the two. Prairie dogs are the size of rabbits. Gophers, on the other hand, are squirrel-sized rodents. Prairie dogs are herbivores, strictly living on berries, roots and leaves. Gophers, on the other hand, are omnivores. They feed on nuts, seeds, berries, grass and bugs. Gophers also are known for stuffing their cheek pouches with an enormous amount of food, much like hamsters, while prairie dogs do not. Prairie dogs live in underground burrows, warrens and tunnels in the plains of North America. Though, gophers also live underground, they do so in the mountainous regions of North America. Because prairie dogs like to live underneath prime farmland, their numbers have dwindled by an alarming 98 percent, as farmers have taken to destroying them in order to save their land. Because gophers tend to live in mountainous regions, they do not have to worry about human predators as much as their prairie-loving counterparts. Prairie dogs tend to live in smaller burrows, consisting of one male, a few females and their young. However, gophers live in large "towns" consisting of thousands of their kind.